Just About Anything: Save The Date! I remember last year when my little Samantha was nearing her first birthday. I was in a frantic search for Save-The-Date cards to send to close friends and family members so that they can save the date and really come and celebrate her baptism and first birthday with us. After all, it only happens once in Samantha's lifetime and we only visit the Philippines once a year. It was difficult to find save the date cards in English since we were in Japan that time so I decided to make them myself. Why save-the-date when I can just call them by phone or write them an email? Because they have a more personal feel and will give the impression that you value the presence of that person in that very special occasion. It also allows the guest ample time to prepare for the occasion and really mark it in their calendars. And one can be creative in the way they present their save-the-date. 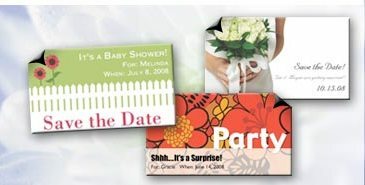 Aside from the traditional cards, there are lots of other options like save the date magnets which invitees can stick on their refrigerator doors so that they will readily see it each time they get a drink, prepare dinner, or eat snacks and be constantly reminded by it. It may be small but it is a fun way to build that sense of anticipation for the actual invitation and the event itself.